If you are tired of overdrive problems, poor gear change, poor gear ratios, or even all three, then there is the option of converting to a 5-speed gearbox. As far as I am aware there are two options, the Getrag and the Toyota transmissions. The getrag conversion is available from Cape International and uses a new BMW gearbox. The kit includes all the components required for the conversion, including if necessary, the centre change transmission cover and carpets. 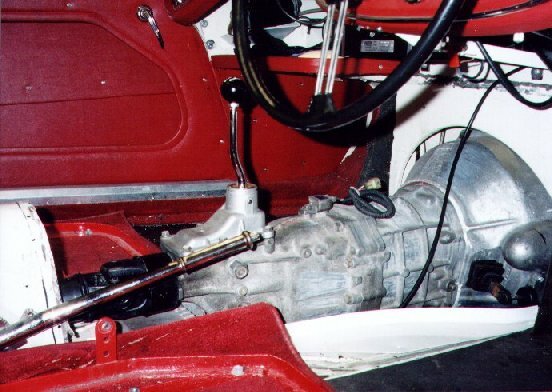 The gear lever is in the same location as the Healey centre change gearbox such that the outward appearance is the same as a standard car. The Toyota conversion is available from a number of sources and in a number of forms, using used gearboxes. Known as the “W” range, the gearbox can be obtained with a number of Toyota vehicles, with different ratios. The best, and easiest to find in the UK, is the Supra 7M-G engine (non-turbo 1986-1992) which has the W58 gearbox. The box is also found in the two wheel drive pick-up trucks. The two people specialising in this conversion are Smitty in California USA (fax +1 805 499 8933) and Conversion Components Ltd. . The latter was featured in a Revcounter article by Neil Munn in December 2000. Other Toyota transmission conversion specialists include Classic Conversions and Realm Engineering , although neither do a specific kit for the Healey, The Smitty conversion is now being sold by Pete Delaney, PO Box 561, Harrisburg, NC 28075. Tel 704-455-2585 Fax 704-455-8504. Note: the Supra 5th gear is the equivalent of a 28% overdrive. This conversion does not require any modification or drilling of the chassis. The conversion uses the Healey engine back plate, flywheel, clutch pressure plate and clutch slave cylinder. First, find a suitable gearbox from a scrap yard. In Leicester I found a yard specialising in Japanese cars and they had five Supras to chose from. They removed the required components from a 1990 model and charged me £120 for the lot. Susequent to writing this page in 2005, Smitty has sold the business to Peter Delaney. Another websites covering this installation can be found here and here. The Smitty kit comes complete with comprehensive instructions and parts listing. The installation can be undertaken with the engine in situ, or as I did, with the engine out in conjunction with a rebuild. Rear gearbox mounting adapter and screws. Toyota W series gearbox complete with bell housing, clutch release arm and rubber gaiter. 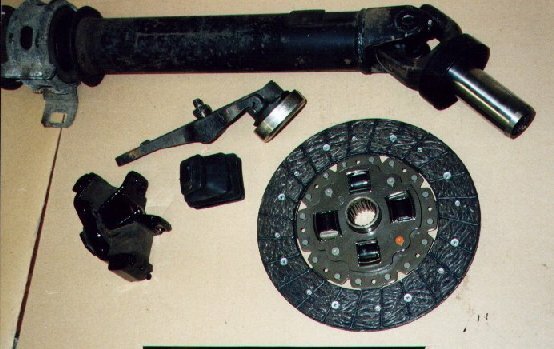 The Supra donor bits, release bearing and friction plate should be renewed. The amount of work required depends upon where you want the gear lever to be. The standard Supra gear lever arrangement will fit under a side change transmission tunnel but will protrude about where the ash tray is. Smitty recommends using an MGB rubber gaiter and chrome retaining ring with this arrangement. However, the W series box can be fitted with different shift towers that place the lever between 23″ and 27.5″ from the engine back plate. The former matches the Healey centre change box and comes from the pick up truck (I think! ), the latter being the Supra. The tower and internal lever for the 23″ location are available but UK Toyota agents that I contacted do not stock them; they are available in the US, and if requested Smitty will supply them. These towers employ different means for retaining the gear lever. The Supra uses a 4 screw cover plate whilst the forward tower uses a bayonet fitting retaining bush. This is not available from Toyota, nor could I find one in a scrap yard. So, I drew one up, had it made in brass by a local machine shop and hand cut the bayonet fitting.See Drawing. In the Supra, the gear lever has an extension incorporating a metalastic bush. This is easily removed and the lever fettled and chrome plated. Illustration of the two lever positions, standard Supra, top, and as Healey centre change bottom. Also lever with new brass retaining bush. 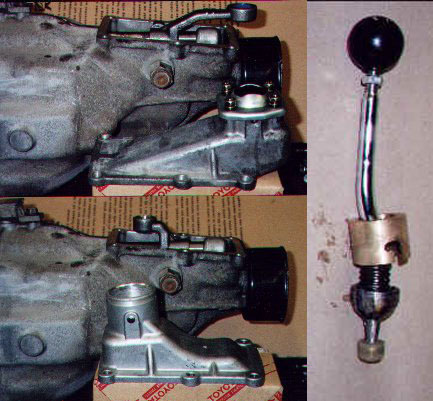 Toyota Supra box assembled with gear lever in forward position. The standard bronze bush in the back of the crankshaft becomes redundant but, can be left in place. The Smitty kit includes an aluminium housing this is pressed into the centre of the fly wheel, and the Toyota bearing is pressed into the housing. First motion shaft spigot bearing fitted to flywheel. Smitty provides an aluminum casting that picks up the existing holes in the chassis and takes the Toyota rubber mounting. A new prop shaft has to be made up utilising the front splined section obtained from the donor car. 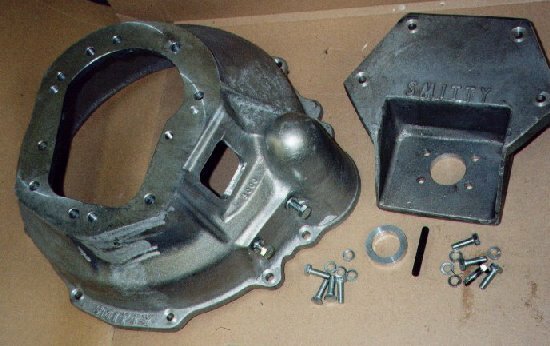 There are several specialist companies building prop shafts and they should carry the remaining UJs and rear flange for the Healey differential. Mine cost less than a new shaft from any of the Healey suppliers. The length should be measured from the car with 20mm of forward movement left on the spline section. Mine measured 505mm between diff’ flange and from UJ centre line. A new speedo cable will have to be made up or included in the supply from Smitty. It is possible to connect the cable direct to the gearbox but, this will require a tight bend that will shorten it’s life. Toyota supply a 90 degree adapter for this purpose, see part number above. I sent this adapter to Speedograph at Nottingham so that they would get the correct end when making up the cable. Cutting a new transmission cover to reduce the height, prior to fibre glassing. 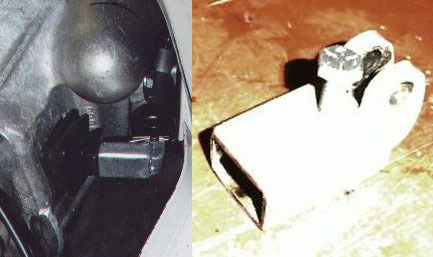 The Toyota release arm does not use a clevis pin for connection to the slave cylinder push rod. 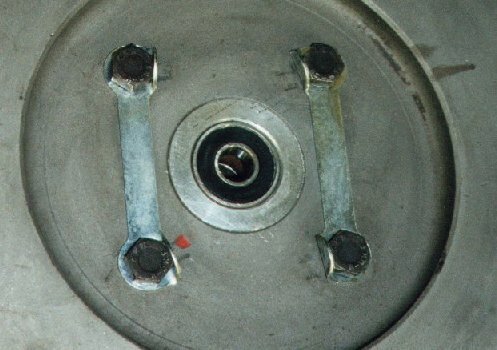 Instead, it just has a recess and the push rod (supplied by Smitty) is trapped between it and the slave cylinder. The alignment of this was not very good as the slave cylinder is mounted too far away from the transmission centre line, apparently to cater for different donor cars. I decided to make up a sleeve to go over the release arm with a pinch screw to locate the recess and drillings to take a clevis pin and standard Healey push rod. The next problem was that now effectively being a longer arm, the clutch would not disengage until the very end of pedal travel. A BJ8 brake master cylinder was substituted (7/8″ up from 5/8″) but this made the pedal too heavy. Finally, a 3/4″ master cylinder provided the correct feel and travel. With gear lever removed, the engine (minus cylinder head) and transmission went in in one piece. The new transmission tunnel required a new BJ7 bulkhead adapter plate and new BJ7 infill sections to each side. Being a bit lower in height than a standard centre change, and because off the peg carpets never fit very well, the carpeting is being made to fit. A comment from Michael Oritt who has carried out the conversion on a BN1. As you may be aware, the BN1 gearbox cover is quite small and is NOT a good candidate for reuse after fitting the Toyota box. 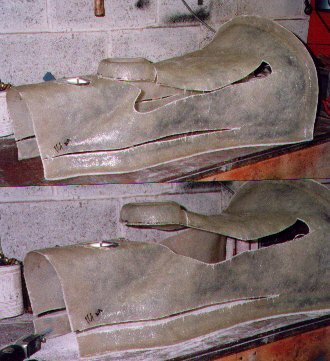 I recently completed the installation of a Moss fiberglass 6-cylinder side-shift tunnel in my car and it was a very good fit, although I did wind up fabricating a new Extension Panel (the removable section of the firewall) to allow for proper access to the clutch slave cylinder. The fiberglass tunnel is long enough to permit one to dispense with the short intermediate tunnel that was peculiar to the BN1’s and there is still room to mount the ashtray between the shifter and the armrest. I recommend to anyone considering this conversion to consider using this cover buying one of these covers rather than patching the inevitable holes in the original, which will nevertheless be a mediocre fit at best. The gear change is excellent and the ratios well spaced. Selection of 1st whilst still moving is useful. Second gear is higher, and for quick overtaking maneuvers is easily selected without burying the lever in the reverse gate. Fifth gear provides even better motorway cruising than OD 4th. With a 3.5 diff’ I am pulling about 27 mph/1000rpm in 5th, i.e over 80mph at 3000 rpm. To look at, the modification is not obvious, only the shorter gear lever giving it away. The old transmission, prop-shaft, cover, and carpets are all in safe storage, and if I get a bout of originality, all can be put back in place without any trace of the car having been modified.